It is a process of conversion of illegal money from various sources to appear to have originated from legitimated (Legal) source. By illegal money we mean to say that the money which has come from illegal sources like drug trading, Smuggling of Gold, Sand etc.. The major sources of illegal money are tax evasion, bribe, Smuggling etc. Mostly all financial institutions or government bodies which is wholly or partially governed by government have also been directed to look into this matter if any one find any suspicious activity in any accounts. Placement is the first stage of money laundering. It refers to the initial entry point of money. In this stage placement of money occurs through various channels like Placing money in bank account, Smuggling money to abroad, etc. It is the second stage of money laundering. It refers to the complex network of transaction which obscure the link between initial entry point and the end of laundry cycle i.e. make separation between the initial entry point & the final entry point. In this stage the money placed is transferred to various account in small units so as to disrupt among various investments like in business, investments in lands, share market, etc. It is the last stage of money laundering. It refers to the return of funds to the legal economy. Basically integration means merging, consolidate or joining. 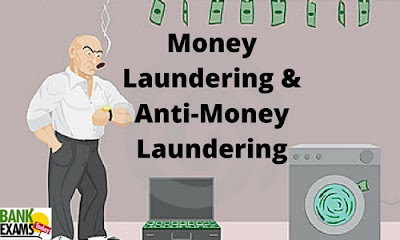 To stop money laundering in India, Government introduced an act known as “Prevention of Money laundering Act, 2002”. According to the act a convicted will force rigorous impersonated of 3 to 7 years and fine up to Rupees 5 Lakh. India’s Bank also introduced various techniques to stop money laundering like “Know Your Customer” norms. ED was made by India to stop money laundering. On international Basis Financial action task force was established (FATF) to combat with money laundering cases and terrorism financing. It is an act enacted by Parliament of India to prevent money laundering and to provide for confiscation of property derived from money laundering. This act was enacted on 17 th January 2003 &amp; it was commenced on 1 st July 2003. If any person found guilty in money laundering case , He/she must be punished with rigorous imprisonment from 3 years to 7 years up may be extended up to 10 years instead of 7 years. If any person found guilty in money laundering case , He/she must be punished under the Narcotic Drugs and Psychotropic Substance Act, 1985 also. It is a process which is formulated by Central Bank of India i.e. RBI to avoid misused of Banking service. This Guideline was introduced in 2002 by Central bank of India. In this guideline all banks need to verify all accounts details. In this process each & every bank obtain information about the identity and address of the customers for maintaining transparency.